Thank you Recorded Books, Inc for sending this audiobook. I will get into the stellar narration by Donald Corren shortly, but first I must break down my feelings about the novel itself. Ray Welter was a brilliant ad executive in Chicago. He was the gent who was so clever that he could convince people to purchase exactly the wrong thing at exactly the wrong moment. While most people would have reveled in this success, it began to eat away at Ray’s psyche. Like picking a scab, Ray could not leave well enough alone, and his life started to splinter. His marriage dissolved, he felt wholly responsible for the demise of part of the auto industry, and he despised how tracked he felt by the powers that be. Similar to the protagonist in George Orwell’s novel Nineteen Eighty-Four, Ray felt trapped, watched and brainwashed. Rather than dealing with his issues head-on, Ray did his best hipster impersonation and headed for the isolated Scottish Isle of Jura, so he could wallow in self pity in the cottage where George Orwell penned his much-studied novel. Add to this plan copious amounts of Scotch and weekly dismembered animals on his front stoop, and you get a relentlessly whiny and unlikable main character. All, however, is not lost. Once Jura’s locals enter the story, you can consider the scene officially stolen. The surrounding cast of this novel is so brilliant and so darkly comic that they saved the novel for me. Each character you meet is more interesting than the next. Not only do they introduce a wealth of much-needed humor to the story, but they give the tale its depth. A man who thinks he’s a werewolf…. a teen who’s as angry as the day is long…. and a man who just might kill Ray and throw him into the drink before the novel is over are just a few of the inane people you will meet. They’re clever, and full of heart. I was crazy about each and every one of them, and was desperate for more details on their backstories. In fact, if I was going to be entirely honest, I would admit that if it wasn’t for the Scots who meander in and out of Ray’s isolation, I might have thrown in the towel on the good old boy. I didn’t care about his botched marriage. I didn’t care about his love interest. I didn’t care about his advertising career (could have seriously done without THAT backstory), and I didn’t care – not even for a moment – about him finding himself. What I did care about was how the other characters related to him, and how his presence impacted Jura’s community. The isle of Jura was a character in and of itself. Its history, whiskey, folklore, reaction to George Orwell, (not to mention its werewolf hunts…) all culminated into a magnificent setting. I couldn’t get enough of the lush weather and the jagged terrain. As a reader, you’ll soak up the physical descriptions of Jura, and will come away knowing that should you ever venture there, a proper pair of Wellies will definitely be in order. The isolation that Jura offered was perfect for a character who was trying to run from his demons, but more importantly, it provided the opportunity to study the people who called the isle home. With hearts on their sleeves and a dry wit that I’ll miss terribly, they’ll stay with you long after the book’s last pages. Now it’s time to sing the praises of the immensely talented Donald Corren, who narrated this audiobook. Mr. Corren was so spot on with every character, that there were moments when I forgot that he was playing everyone, including the females. His brogue was impeccable, and it took me by surprise more than once (watch yourself if you’re having a tea; you might end up wearing it). His affection for the people of Jura was evident throughout the book, and his subdued (and often bewildered) Ray Welter was excellent. 5 stars for Mr. Corren’s performance. 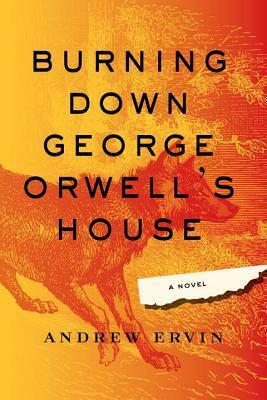 Overall, I think you should give Burning Down George Orwell’s House a try. It’s smart, dark, and hilarious in all the right spots. 4 stars for this charming novel.